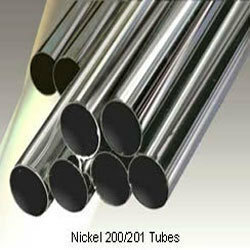 Other of a wide range of products which include Nickel 200 Tubes and Nickel 201 Tube. Nickel 200 is Commercially pure (99.6%) wrought nickel with good mechanical properties and resistance to a range of corrosive media. Good thermal, electrical and magnetostrictive properties. Used for a variety of processing equipment, particularly to maintain product purity in handling foods, synthetic fibers and alkalies. Commercially pure (99.6%) wrought nickel essentially the same as Nickel 200 but with a lower carbon content to prevent embrittlement by intergranular carbon at temperatures over 600°F (315°C). Lower carbon content also reduces hardness, making Nickel 201 Tube particularly suitable for cold-formed items.